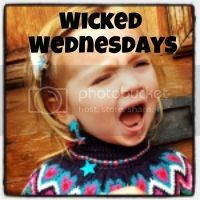 I wrote about Fridsy in my post on Sunday here, however I saved the picture that really symbolised the tantrums until today… I knew it was a #wickedwednesdays moment!!! A picture of H’s welly boots on the floor in Patisserie Valerie in Next. It was the start of the tantrums screams and downright terrible time for both of us. My toddler, who for?the last goodness knows how many months (6 or 7, so, 1/3 of her life) and insisted (tantrum-tastic style, obviously) on wearinging wellies everywhere*, took them off and SCREAMED the place down when I tried to put them back on. To be clear she screamed and kicked them off. Lucky mummy didn’t get a black eye #mummywin! *To clarify by wearing them everywhere, I mean EVERYWHERE. In the house constantly, so much so she has indoor wellies so she doesn’t embed mud in every surface, outside, everywhere regardless of weather. brummymummyof2 recently posted…Making Summer Clothes Shopping With Kids… Bearable. My almost 3 year old is now refusing to wear shoes and socks. Including on the reception area at speech and language. It was pretty funny. Cherrysnotmyname on Toddler puzzles: Orchard Toys Once Upon A Time puzzle?